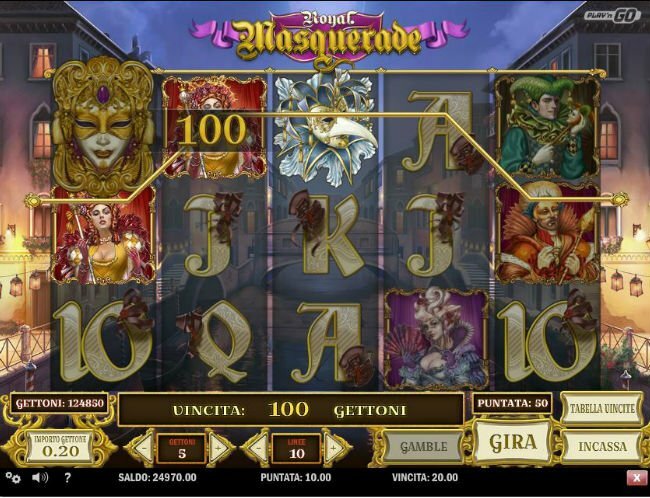 Royal Masquerade is so much more than a simple dress-up themed slot, masquerading as a big money game. It is a beautiful looking, really rich paying slot, which can be played for peanuts and offers so many stacked symbol wins. So few video slots are able to capture the art of Masquerades quite like this Play ‘n Go slot has. 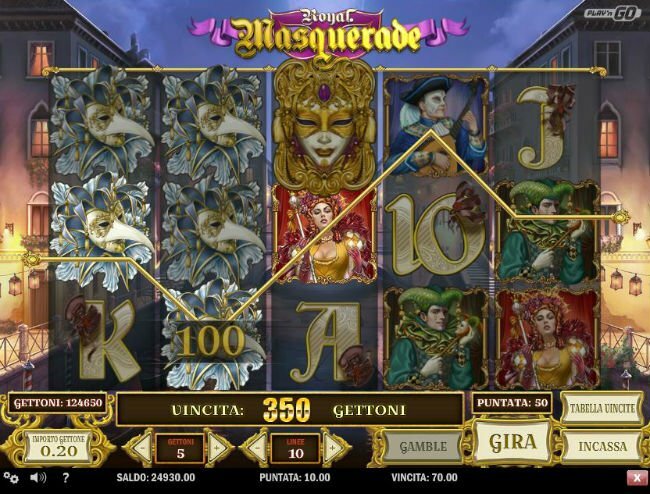 The Royal Masquerade game offers you 5 reels and 10 paylines of Venetian ball action. It may not have the most extensive array of special features, but the Royal Masqueradeslot machine does use some of the most stylish graphics available at the minute. Suffice to say, it cannot be rivalled. Those amazing graphics include a host of different costumes, many of which are royal in design. Jesters, queens, musicians, kings and emperors are all present in the Royal Masquerade slot machine, which features splashes of colour aplenty and oodles of beauty. The Royal Masquerade slot offers you complete control over your bets. You can adjust the value of your coins, as well as how many you wish to stake per line. Paylines are also adjustable. Players can expect to get away with minimum wagers worth as little as 1p per line, per spin, or 10p a pop if you want to play with all of the paylines. Wild symbols in the Royal Masquerade slot all appear stacked. Wilds can replace all other symbols save for scatters, and since there aren’t that many symbols on the reels to begin with (just three per each reel), you stand a more than reasonable chance of landing some luxurious loot. The special icons in the Royal Masquerade slot tend to exceed the normal confines of a symbol. For instance, the golden mask icon bares not bones about cutting into other symbols’ positions, not does the white feather mask. These special, enlarged icons are definitely going to do you some good. One of the main features in Royal Masquerade is the Win Spins setup, which you may have come across before. In the Royal Masquerade slot, landing 3 or more scatter icons will trigger 5 Win Spins. These are basically free spin games, but ones in which you are guaranteed to pocket a win on. There’s no complaining there then. Royal Masquerade’s slot bonuses aren’t actually that original. Indeed they appear in other Play ‘n Go slots, too. But, as we’ve said, it isn’t the special features which make this Venetian party themed slot really stand out. It has been a pleasure to write the Play ‘n Go’s Royal Masquerade slot review. The game is a treat to play, even if you might not think its theme is your cup of tea. 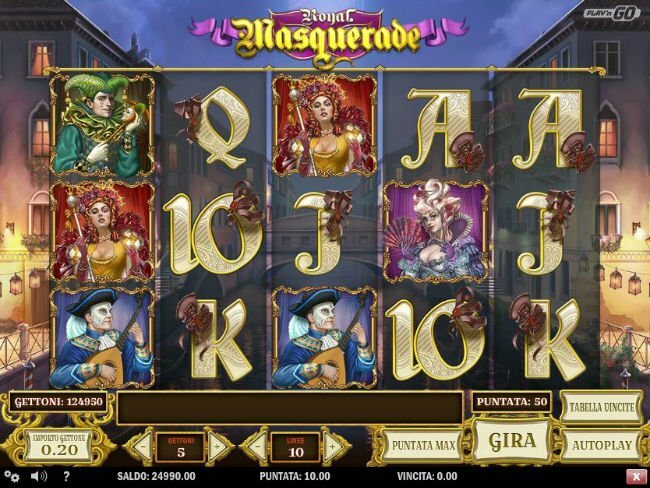 Royal Masquerade is so much more than a simple dress-up themed slot, masquerading as a big money game. It is a beautiful looking, really rich paying slot, which can be played for peanuts and offers so many stacked symbol wins.